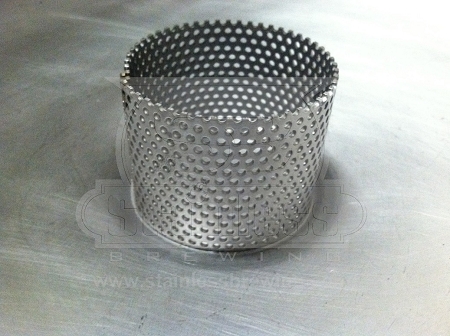 Our 2" x 1 3/4" model works perfectly in keggles, fitting snugly into the bottom of the keg and leaving room for the hinges on our 15" Hinged False Bottom; a great combination! Made from the same material as our false bottoms. 3/32 on 5/32 16ga 304 stainless steel. I am using a home made false bottom. I was having problems when using a large grain bill,the false bottom would collapse.This product completely solved my problem.Was very glad to find this available at such a reasonable price. Works great with the 15" false bottom. I am very pleased with the product quality. WOW combined with the 15" false bottom this is a winning combo I have had no problems with this system for 2 brew days so far. Got this along with the 15" false bottom. Does its job, decent price.